Wildflower lovers are in luck, because the 2018 Roadsides in Bloom Calendar is now available. State agencies make this popular publication possible. It’s sponsored by the West Virginia Department of Environmental Protection and Department of Transportation. Photographers from West Virginia as well as surrounding states vied to have their work included. Twelve pictures are featured, including shots of some wildflowers growing naturally along state roadways. Other pictures showcase the Operation Wildflower project which is credited with planting more than 250 acres of wildflowers along state roadways. It began in 1990 with a test site on Interstate 64 near Huntington. There are no sites on every interstate highway in the state. Flower beds are seeded to provide a continuous color show throughout the season. 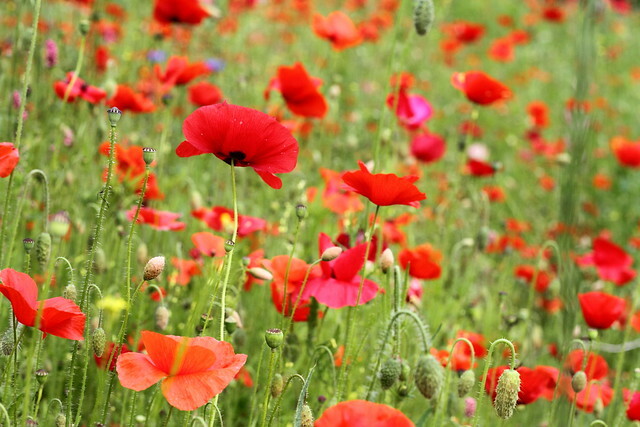 Bright red poppies in the spring, followed by deep blue bachelor’s buttons in late spring and early summer. Mid-summer brings yellow Coreopsis until pink and white cosmos take over until killed by frost in the fall. State agency staffers, aided by the West Virginia Native Plant Society and commercial growers, are now working to develop a mix of purely West Virginia native plants to replace the current one. These beds are funded by organizations, businesses and individuals who help sponsor the planting and upkeep. A sign is placed near the wildflower bed to honor the name chosen. Donations must be received by Feb. 15 for planting to occur that year. The winning pictures were chosen from dozens of entries submitted by photographers from West Virginia and surrounding states. You can order online, call 800-322-5530 or email dep.aah@wv.gov. Requests are limited to one calendar per household. West Virginians receive priority since a limited number are available for distribution.